A probiotic complex containing organic, freeze-dried burdock root and beetroot and stabilized rice bran (SRB), in pure form with no additives, fillers or other excipients. Burdock roots contains an astonishingly high percentage of fructooligosaccharides (FOS), making it one of the most valuable plants for enhancing beneficial bacteria. Burdock also contains the prebiotic compound, inulin, which helps support healthy immune function. Beetroot provides prebiotic and immune supportive oligosaccharide inulin. Stabilized rice bran (SRB) is a good source of soluble and insoluble forms of fibre. These help maintain a healthy digestive tract alongside probiotic fibre. Fructooligosaccharides (FOS) in SRB is particularly significant to the role of beneficial bacteria, acting as a prebiotic. View product label for full list of ingredients and nutritional values. 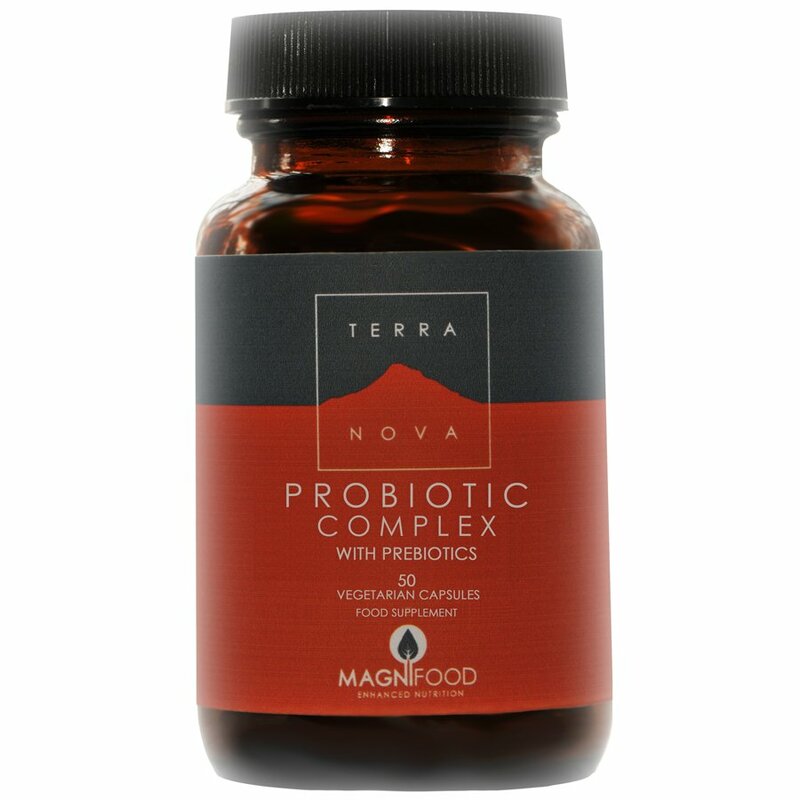 The Terranova Probiotic Complex w/ Prebiotics - 50caps product ethics are indicated below. To learn more about these product ethics and to see related products, follow the links below. 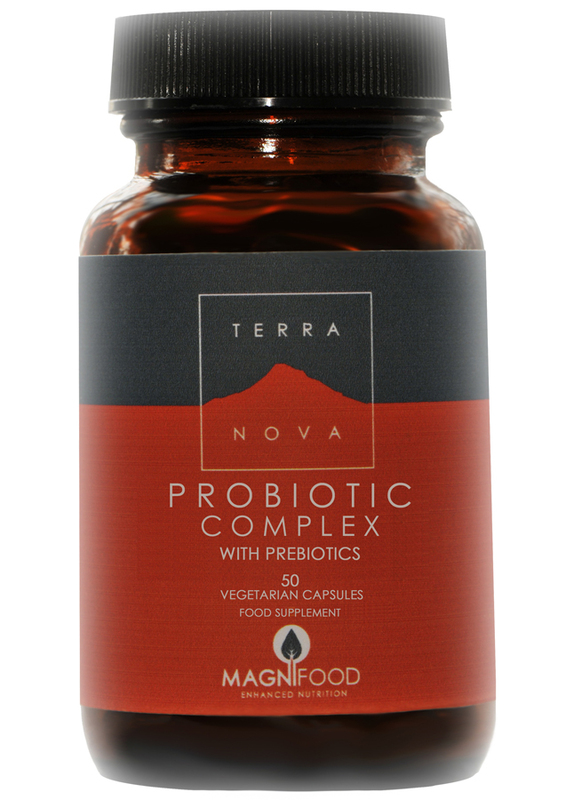 There are currently no questions to display about Terranova Probiotic Complex w/ Prebiotics - 50caps. The Terranova philosophy is based on deep healing, profound wellbeing and complete nourishment. They develop formulations using only pure, natural ingredients that have been scientifically proven to offer health and wellness benefits. Terranova don’t use laboratory-isolated natural chemicals and pharmaceutically adulterated plants. Instead, they use fresh botanical and superfood ingredients in the purest form possible. Terranova products are free from binders, fillers and other excipients. Terranova supplements are designed to be synergistic and holistic – unlocking the potential of nature’s best compounds in perfectly balanced combinations.